Bethesda, MD Ukulele Lessons Near Me | Fun Classes. Top Teachers. This class is intended for those who have never played a `ukulele, a beginner or continuing student. Yao will learn how to hold, tune, and play the `ukulele for sing-alongs. Basic theory such as rhythmic values (whole, half, quarter, eighth notes), time signatures, etc. will be introduced. You should be able to play several different basic strumming styles, read and understand `ukulele chord charts, transpose songs into other keys, and play along to a large selection of songs, or play at least one song all the way through! Experienced in teaching ukulele for over 5 years. Experienced in teaching other stringed instruments (guitar, bass, mandolin) for over 30 years. I played on a toy piano when I was very young, learning a bit of sight reading from my Mother, while listening to classical, jazz, and rock music. When I was 12, I learned guitar and later took private piano lessons from a prominent Philadelphia instructor. After playing in a rock band in high school, I went to college and received my degree in Physics. During this time, I joined a choir, and sang and played guitar in a contemporary vocal group where I became the lead guitarist and vocal arranger, and later became the director. I also played guitar in my church, as well as in a small folk group, performing music of the Beatles, Bacharach, Crosby, Stills, and Nash, and many others. I also played or sung in a number of weddings during my college days. imultaneously pursuing my music ambition. I studied classical guitar at American University with a student of the great Andres Segovia, and also studied jazz guitar with a former student of a prominent jazz guitarist, Pat Martino. Additionally, I sang in choirs and studied composition privately with a prominent Washington area composer and performer from Catholic University, I also began to teach at an area performing arts academy. My most long-term experiences in music have been serving in my local church for over 30 years, either playing guitar (acoustic, electric, bass), piano, or arranging vocals in a contemporary worship band. I also started a church choir, and led both choir and small orchestra in a number of special performances. Additionally, I led congregational worship in different scenarios. During this time I also taught students of all ages guitar, piano, and music theory, and have continued to today in helping students to find their musical potential and pursue their musical ambitions. I have recently retired from my engineering career so I can use my musical gifts in my local church and teach music as a second career. I have completed my second degree at George Mason University, and continue to play with other musicians there. More importantly, I continue to learn how to better teach others of all ages how to grow in all aspects of music-making. Having taught for many years, my approach is flexible and I can adjust my teaching style and/or curriculum to maximize the student's potential for learning at any age. I encourage disciplined practice while working to make learning music an enjoyable experience. Although I specialize in guitar styles, I also teach piano, and can include music theory, sight reading, composition, and how to improvise on any instrument. I have taught improvisation on a number of different instruments such as violin, cello, flute, and clarinet. Geoff is a patient and encouraging instructor. He tailored my lessons towards the skills that I needed. He provides the necessary encouragement when the long hours of practice seem impossible to sustain. I could write a book about Geoff's credentials: highly qualified is an understatement. -- Neal B. I'm sure I could learn to Play Guitar Today using books and videos, but I think I'm on the right track with private one-on-one instruction.  Linda H.
I provide self-produced instructional material. Students provide their own instrument and a folder to store instructional material. I teach any style of guitar, including classical and jazz. I also teach improvisation or "playing by ear" on any instrument; my experience includes piano, violin, cello, clarinet, and flute. I've played classical guitar and in classical and jazz ensembles at weddings and other special events. I totally enjoyed my class with Geoff. We immediately started my lesson with tuning the ukulele. Then we went over the cords and strumming. I have been researching on playing the ukulele and his explanation on the strumming was a lot better than the book. He is teaching me how to play by listening to the notes which is great because I would be able to play the Hawaiian music for my hula classes. In addition, his studio is only a 5 minute drive from my house, which means I don’t have to deal with traffic. Geoff is great! Really knows what he’s doing. I’ve learned a lot in the three weeks that I’ve been working with him. 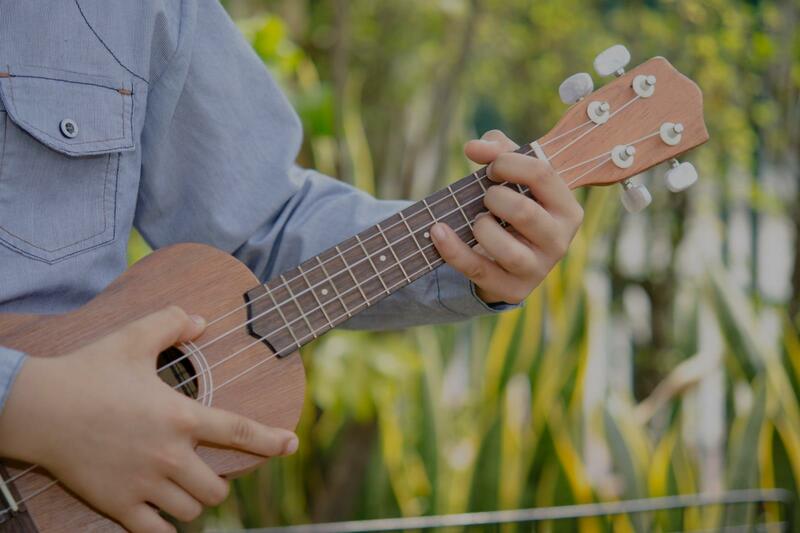 See how easy it is to learn how to play the Ukulele! With one to one instruction, you'll learn to play chords, scales, note reading, tablature, finger picking, strum patterns and improvisation. Within just a few lessons, students will begin learning how to play their favorite songs, including, "Somewhere over the Rainbow" ," I'm Yours", "Hey Soul Sister" and many more. Also, students will learn how to play various styles of music like, Blues, Pop, Classical and Rock. I have been playing for about 35 years and teaching music and guitar for 25 years. I have a Bachelor of Music in Jazz and Classical guitar. I've taught at the University level and currently maintain a professional studio in Arlington, Virginia. I am very well versed in many different styles of music including, Rock, Blues, Jazz, Classical and Suzuki guitar. Students who decide to sign up with me, will have a lesson plan, a strategy for meeting their musical goals and will enjoy themselves in the process. I have been teaching for about 25 years and am well versed in Jazz, Classical, Rock, Blues and Country genres. I focus on anything from note reading, theory, improvisation and composing. John is exactly the kind of teacher I need and was looking for. He made it fun, and I felt like I learned more in my first lesson with him than I had in all my prior lessons combined. Already looking forward to my next lesson! John is very accommodating of my schedule and always provides me with new tips to advance my skills. He’s super cool. 100% recommend. I have been taking guitar lessons from John for several years. He is an excellent instructor, and is very patient and knowledgeable. I am challenged every week and have learned so much from him. I highly recommend John as an instructor for guitar and for the other instruments he teaches. I have had the opportunity to really stretch the limits of the ukulele because of the classes I teach with the instrument. In addition to the typical strum-along style of Uke playing, I can teach the Ukulele in a great deal of styles and using a great number of techniques. Have fun and learn to read music on a cute and easy instrument. Great for young children just starting out, and enjoyable for adults wanting to add Ukulele to their bucket list! "Very patient and skilled instructor." "Great instruction that is understandable and positive. As a beginner I want to learn and have fun-- John does exactly that." en researching on playing the ukulele and his explanation on the strumming was a lot better than the book. He is teaching me how to play by listening to the notes which is great because I would be able to play the Hawaiian music for my hula classes. In addition, his studio is only a 5 minute drive from my house, which means I don’t have to deal with traffic." "Great instructor. I'm making progress!" "John is great. I really enjoy my ukulele lessons with him." "John has been a great and patient teacher for my 7yo daughter. She’s learning to sight read, music theory and rhythm :)"